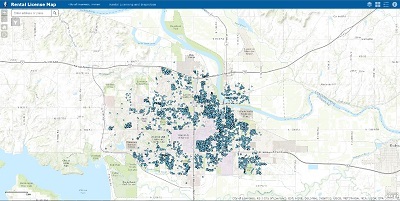 Click on the map above to access the interactive map of active rental licenses. Left-click on a rental license (blue dot on the map) for rental license information at a specific address. Note: some licenses when clicked may include information on multiple licenses issued on a property. The top of the license information box will indicate multiple pages, one page for each license. The map shows rental dwelling unit licenses that have been issued by the City of Lawrence, Kansas and are active and in good standing. Please note: Some rental dwelling units are not required to be initially licensed until December 31, 2015. All rental dwelling units in the City are required to be licensed by December 31, 2015.